What? 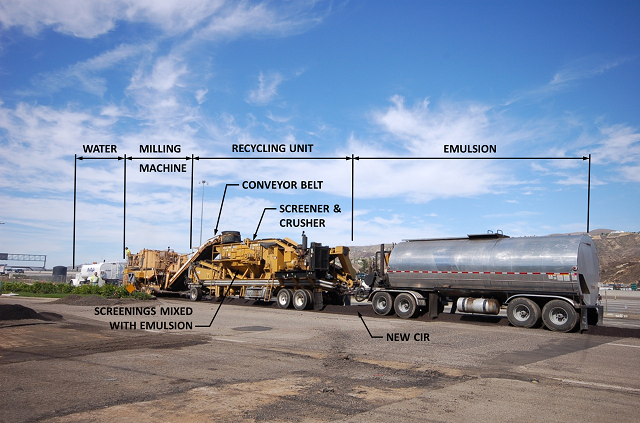 Cold in-place recycling (CIR) process involves a milling machine with a paver mixer. The milling machine breaks and pulverizes a thin amount of the top layer of the old pavement. It can also break and pulverize all of the HMA and some of the base. This material is crushed and screened to the proper size and recycling agents are mixed in to rejuvenate it and give it more life. If necessary, virgin aggregate can be added and spread on the existing surface. Recycling agents that are used include: emulsified asphalt, foamed asphalt, and chemical additives. The material is deposited into a windrow behind the machine and then picked up by the paver and spread. Then, it is compacted using steel-wheel, pneumatic-tire, or vibratory rollers. CIR material tends to have high voids so a HMA overlay or double surface treatment is applied as a wearing course to seal and preserve the recycled pavement layer. Why? CIR is useful in treating a wide range of distresses and failures such as: raveling, potholes, bleeding, skid resistance, rutting, corrugation, shoving, fatigue, edge, and block cracking. It can improve the ride quality caused by bumps, swells, sags, and depressions. CIR can be performed relatively quickly which reduces user delay. Brittleness of aged existing pavement is enhanced, and it can provide improved rutting resistance in the pavement life. Extensive laboratory research has shown that CIR is effective in improving performance of the pavement while also reducing overall cost. When? CIR is limited to applications where underlying soil structures are adequate. It addresses issues restores old pavements to a like new condition while also being environmentally friendly.